Even though it's just a minifigure Iron Patriot makes quite the impression and is instantly recognizable as the Armour from Iron Man 3 and/or the Marvel comics (of course since he's based on the movie looks a bit different than the comics version). Of course being a liscensed figure he extremely well detailed down to the miniscule writing saying "DANGER" on the left and right of the front torso and the little star on his right leg. Though "Gun Mounting System" is the name of the set the system itself is of quite small and simple with no particularly unique parts. The Iron Patriot figure on the other hand is mostly new with the back pieces being pretty common and the head having appeared in 76006 Iron Man: Extremis Sea Port Battle (as the head of War Machine which makes sense since he is the same person in this suit) the helmet, torso and legs however are all new and exclusive to this set. Some images of the set in its entirety borrowed from the Brickset Flickr account. The Gun Mounting System is made mostly of "safety yellow" with some basic clamps and red warning lights on a yellow 2X4 plate. Being a movie based figure Iron Patriot is even more detailed than a standard liscensed figure with all the individual armour plates on the chest of the movie character translated precisely on the figure. His helmet is the standard Iron Man type coloured in Earth Blue with a silver and red highlighted face mask. Aside from the colours Iron Patriot has almost the exact same printing as War Machine the only difference is that the printing on War Machine's centre torso just below the arc reactor reading "FF 446" has been replaced by a silver star around the arc reactor on Iron Patriot. The back brace and "minigun" are also the same as War Machine albeit this time they are in all black colouring. The printing on the legs shows the thigh and kneecap armour, and another silver star this time on the right upper thigh, with an absence of detail for the shin plates but a bit of extra detail on the toes. The only back printing is on the torso with more armour plates, a blue on sivler star on the back of the right shoulder and a military stripe on the back of the left shoulder. 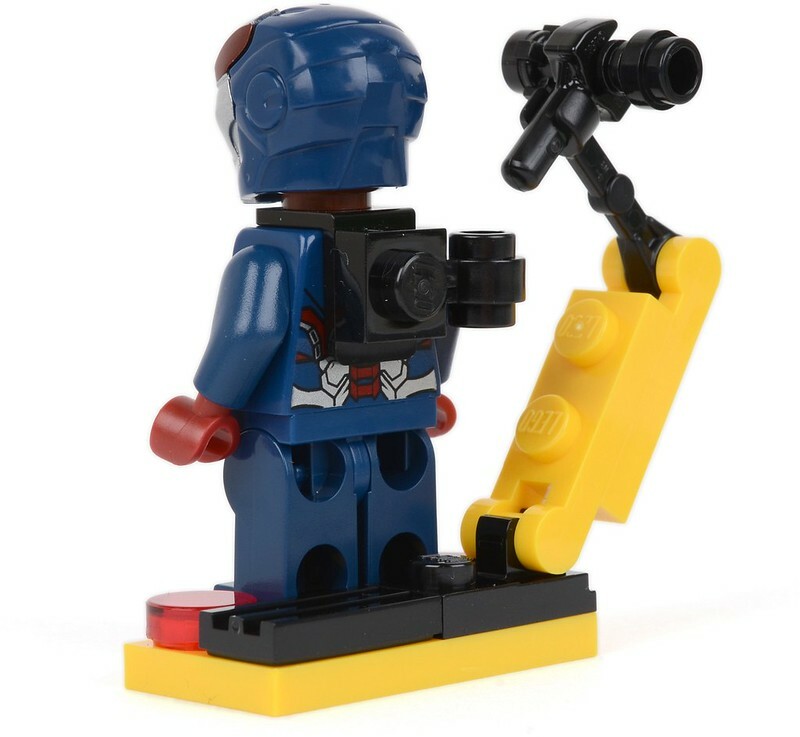 Since this set is a poly-bag it's obviously quite small and relies more on adding this set to another, the only real function of the gun mounting system is to of course mount the "minigun" on the back of Iron Patriot. Being a 17-piece set the build experience was simply putting a few pretty standard pieces on tho a 2X4 plate and building a minifigure. This set was a free pre-order bonus promotional set for Lego Marvel Super Heroes therefore there isn't a MSRP and no real investment in the set itself. If you're looking to buy online from a reseller and add Iron Patriot to your collection I would say that even though I don't like to spend much money on individual figures I would pay a maximum of $20 for a sealed 30168 Gun Mounting System (this may seem low to some but that's the highest I would pay for any figure). If you're looking to buy it for investment purposes I would try to stay below $15 ( just under half of the Bricklink selling price) though you could justify $20. Super Heroes is one of the most popular themes currently available and is no doubt aided by the recent and ongoing movies and cartoons. This set is of course based on the Iron Man 3 movie with the Iron Patriot armour having a semi-prominent role in the film. Even without the connection to the Marvel Cinematic Universe this set would probably still be pretty popular since the Iron Patriot armour is one of the most popular in the various Marvel universes. This set was, and so far is, exclusive to the pre-order promotion for Lego Marvel Super Heroes, however there is a chance that Iron Patriot could have a prominent enough role in a future Marvel film to warrant release in another set. It's not a big chance and he could very well remain exclusive to this set forever but there is the possibility of rerelease. But for now and the forseeable future Iron Patriot is singularly exclusive to 30168 Gun Mounting System. As with most promotional poly-bags this set has good potential, add to that the fact that the figure included is exclusive and you're looking at a pretty high return for a single figure. After having been released just under six months ago we can take a look at the Bricklink guide's average sold price for 30168: Gun Mounting System to get an accurate idea of the best selling price. Since 30168: Gun Mounting System never really had a production run, was only available for a short period of time and has effectively already been retired all the potential growth happened in a very short period of time therefore it's unlikely that the average selling price for the set will experience any major fluctuations, and will probably only go up or down a few dollars from the current average sold price (new) of CA $30.22. Though there isn't very much at all to the actual gun mounting system the Iron Patriot minifigure is very eye catching thanks to the red, blue and silver colour scheme. It's an interesting kind of amalgamation with Captain America's costume colours overlaid on Iron Man's (or in this case War Machine's) armour. Even as someone who is not from the U.S. I have to admit that the red, blue and silver-starred minifigure looks very neat. 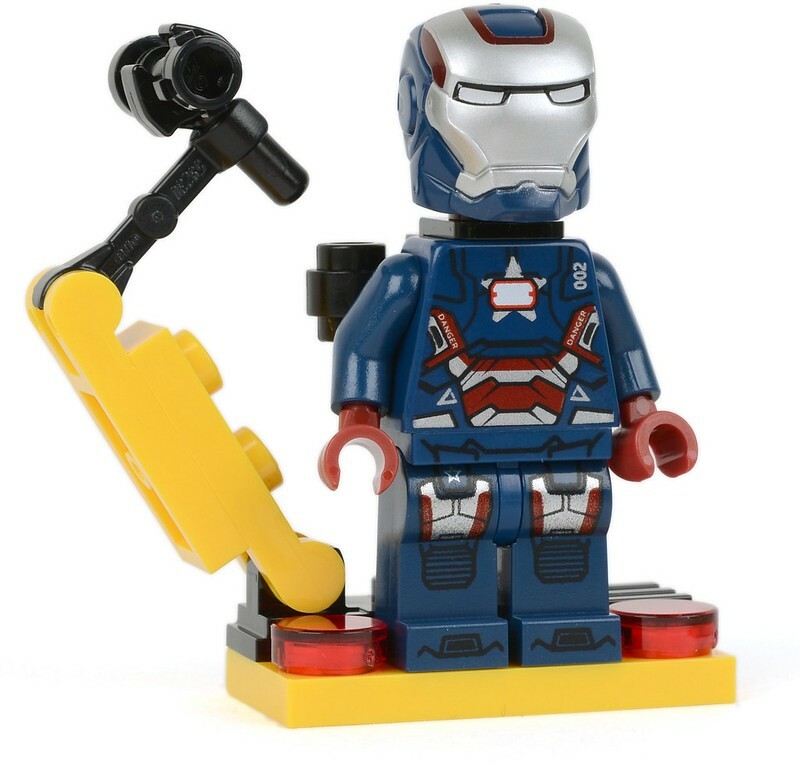 While the gun mounting system itself is small and barely worth mentioning it's the Iron Patriot figure that is the real star of the set and is a great minifigure to add to your personal colection or portfolio. If you got this for free as part of the promotion and like the figure I would keep it since it seems unlikely that it will be released in another set any time soon or perhaps ever, if you don't really care for the figure now is probably as good a time as ever to sell it seeing as it is unlikely to experiecnce any further growth. If you're looking to buy this figure for your personal collection or to resell now you might have a bit of trouble finding a lower price since the price has mostly stabilized at around CA $30 but you could probably find one listed at a low sum.